Set on the third floor of Milford House, a luxurious new London development, this exquisite one bedroom apartment boasts modern and open-plan accommodation and a private balcony. Ideally located on The Strand in the heart of Covent Garden offering a fantastic range of amenities, restaurant's and shops on the doorstep. Temple Underground Station is also only moments away. My favourite place in all of London, the Royal Opera House stages world class performances. Although top seats are pricey, you can get cheap tickets from £5 if you're happy to be further back. 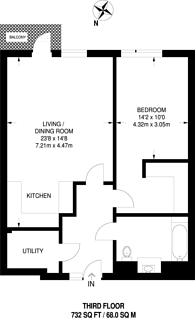 732 (68 Sq M) approx. We have over 1,000 property market reports for locations across London and Surrey - including WC2 and The Strand.